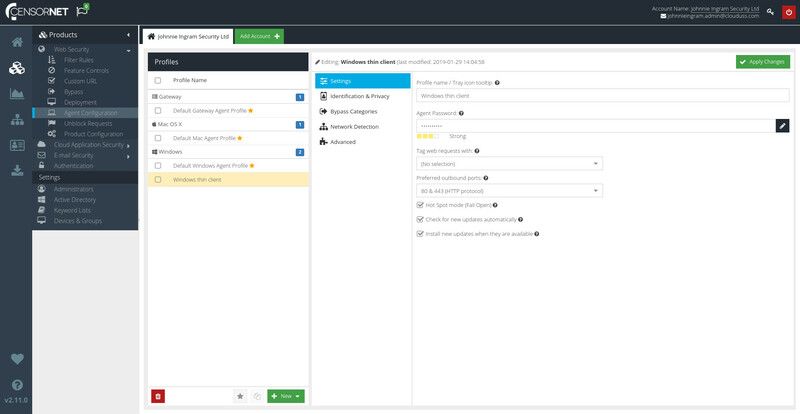 Agent Configuration Profiles are used to manage remotely deployed Web Security agents. Agents download their settings through Agent Configuration Profiles. This makes it possible to manage configuration centrally, and to have different configuration settings for different types of agent (for example fixed desktop machines or roaming laptops). To see all your Agent profiles, visit your USS Dashboard, and then click Products ⟶ Web Security ⟶ Agent Configuration. The Agent Profiles are grouped by Type for ease of management. All accounts have a default profile for each agent type - Windows, Mac OS X or Gateway. These serve as a basic configuration, which can then be modified. There must be one default agent profile for each agent type you are deploying, or registering an agent will fail. The icon identifies the default profile in each group type (there can only be one). To change the default profile for a group, select a profile and click the button at the bottom. To create a new profile, click the button, and choose the type of profile you want to create. Give the new profile a sensible name, and click . If you want newly registered agents to use the new profile automatically, remember to mark it as a default for the Agent Type group. You can now select the newly-created profile, and update its settings as required. To delete an agent profile, select the profile and click the button. Default profiles cannot be deleted. To delete a profile currently marked as default, first set a different default profile.